Dear sweet Jesus, stock Citroën Saxo racing is the real motherflippin deal. These front-drive French hatchbacks used to be the hot tuner car of choice in the UK back in the '90s and early 2000s, but apparently now they're being used as spec racers. And let me tell you, that racing is some of the toughest wheel-to-wheel stuff you will see anywhere. I'm talking about the car in the lead two-wheeling nearly into a rollover, snapping back onto track and punting off the new leader in the process, and then busting out its glass as it punts out another car fighting for the lead. And that's just one corner. 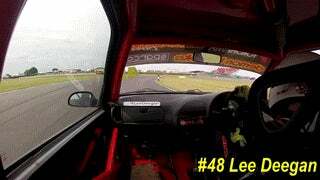 This is just the first lap of just the first race of the 750mc Stock Hatch Snetterton 200 2014 event over the weekend. I could watch this crap all day. Man, why is it that the teeniest, cheapest racing series (from Groms to Citronetas) always have the nuttiest action? Hat tip to Speedycop and CarThrottle!